The opening ceremony that’s held at the beginning of the year on January 7th is one of the few traditional events that continue today. In the past, the Hanamachi streets were filled with people from the Okera Mairi festival – also known as “Gion Kezurikake,” where people gathered to burn medicinal herbs for good fortune, throughout the New Year’s holiday.” However, now that the three-day holiday has been established, the opening ceremony serves to both celebrate the start of the new year, as well as the start of business for the Hanamachi. 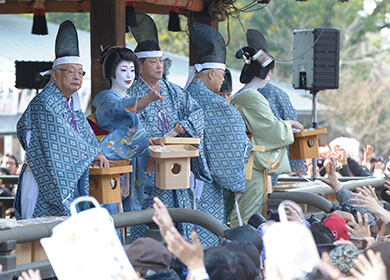 At the Setsubun Festival, held yearly on February 2nd and 3rd at the Yasaka Shrine, the four local Hanamachi perform a dance in front of the shrine and sow beans. Also, there is an event called “obake” held in the Hanamachi on the day of Setsubun, where people wear costumes in order to ward off evil spirits. People from the Edo Period up to the early Showa Period believed in the folk story of “obake” ghosts. Old women would tie their hair up in young women’s styles, and young girls would tie their hair up in adult styles, and they would wear costumes and visit the shrine. The demons that frequented would pass by them as they looked different from usual, and inviting laughter with the costumes was thought to exorcize the ghosts. This tradition continues in the present age, as geisha think up clever disguises, and thrill the banquet rooms as they make the rounds. On the night of Setsubun, you might just run into an “obake” ghost that’s going to and from the tea houses. The Kamogawa Odori, which brings a beautiful color to the newly green Kyoto, was founded in 1872 as a part of the 1st Kyoto Expo, as a way to attract tourists, in wishing for the prosperity of Kyoto after the capital was moved here from Tokyo. 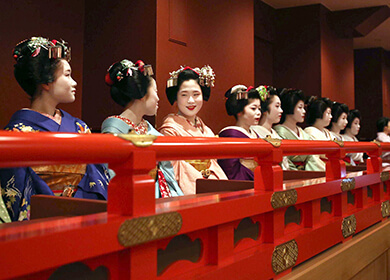 Since its inception, it has continued for over a century, and has become an annual event in Kyoto, with a gorgeous stage and a Kyoto-inspired tea ceremony with the Kyoto-style geisha and maiko, boasting beauty and sophistication. The geisha of the give Hanamachi districts in Kyoto (Pontocho, Kamihichiken, Gion-higashi, Gion Kobu, and Miyagawacho) all come together for a joint performance. 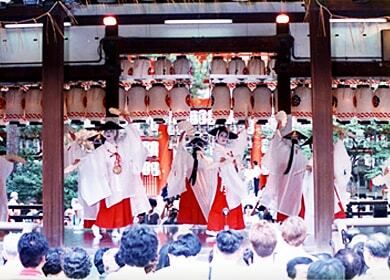 Approximately 80 geisha and maiko will showcase the dance of each Hanamachi. The performance is held in Minami-za, Kyoto. The Ise Pilgrimage, with the Ise Grand Shrine as its objective, has a long history dating back to the early Muromachi Period. Additionally, the pilgrimage to Koyasan, which was once closed down by Kobo-Daishi, has been popular for quite some time, and in particular after the Meiji Restoration, since the ban on women has been lifted, the pilgrimage has rapidly developed. In 1880, the Ise Pilgrimage “Maruju-gumi” was formed in Pontocho, composed of tea houses, geisha, and gentlemen, who would make the pilgrimage to the Ise Grand Shrine. Additionally, the Koyasan pilgrimage “Kamogawa-gumi” was formed, and in May 1923, they built the Kyoto Kamogawa-gumi Columbarium Tower to console the ancestral spirits in Hanamachi, and in 1937 a nightlight was dedicated to the tower. 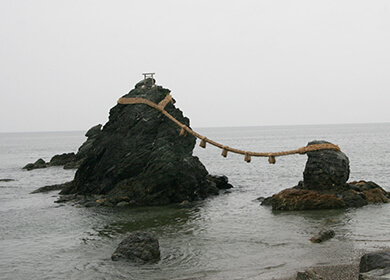 On the Ise Pilgrimage, a pair of stone lanterns were donated in 1938 to the road that approaches the Futami Okitama Shrine of Futamigaura, which is famous for the Meoto Iwa (Wedded Rocks). 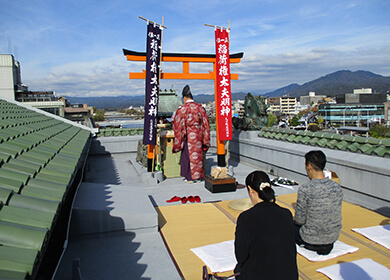 Currently, every year between June and July pilgrimages are held alternately between Ise and Koyasan, and the pilgrimages serve to foster mutual friendship as well as recreation. The Gion Festival in July, one of three major festivals in Kyoto, is a Yasaka Shrine festival, began as a prayer to fend off sickness, and has continued for over one thousand years. The festivities last for a month, beginning with Kippuiri on July 1st, and with various Shinto rituals and events taking place during the month. From last year, the float progression was divided into 2 parts, with the first taking place on the 17th, and the second on the 24th. Every year on the 24th, the Hanagasa event is held, and the Pontocho Kabukai Association participates every other year. 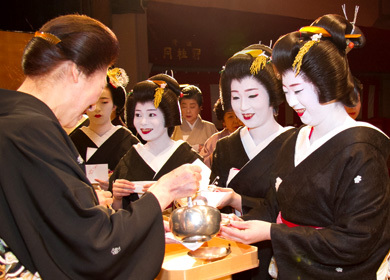 Geisha perform a kabuki dance at the Yasaka Shrine pavilion. The costume includes a black conical hat, crimson chest strap, red hakama pants with white accents and a slight bit of exposure, and a gilt bronze ornament hung from the waist, which is believed to be in the image of Izumo no Okuni, the shrine miko who was the originator of kabuki. The Suimeikai, one of the representative events of the Pontocho Kabukai Association, was first held on March 15, 1930. It’s a developmental consolidation of the “Nagauta Chiyosakaekai ” (first held Feb 1907) and the “Saturday Meeting” (first held Sept 1927), which were held before as part of the kabuki research association. At the time, it was compromised only of geisha who had an abundance of talent beyond the special basics. As such, it’s a particularly prestigious kabuki presentation. In November, each shrine in Kyoto holds a Shinto event called “Ohitaki.” This is an event for showing gratitude for the year’s harvest. 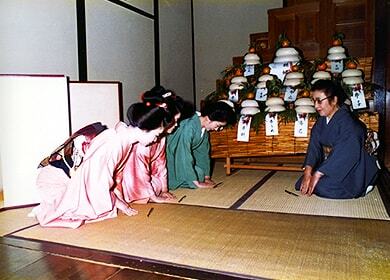 It’s said to have begun from the Niiname-sai, a ritual that took place in the Imperial Palace where the Emperor of Japan gave thanks for a prosperous year, and spread to the general public. Before, the event was held not just at shrines, but also in common households and within the town. Mandarin oranges and manju were offered, prayer sticks burnt, and then the mandarin oranges were cooked with the remaining fire. It was believed that eating these oranges would prevent catching a cold in the winter. At the Pontocho Kabukai Association as well, around November 20th as the cool winds begin to blow, the Ohitaki event is held, by making a visit to the water god (Suijin) of the unlucky northern demon gate together with the highest-ranked harvest goddess (Shoichii Inari Gontayu Myojin) on the rooftop of the Kaburenjo. 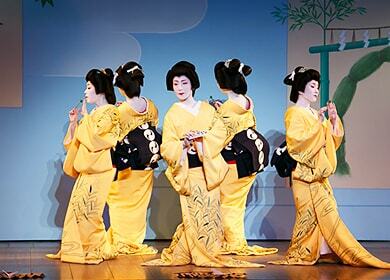 During this performance, the geisha and maiko of the five Kyoto Hanamachi will all watch the performance, which is called the debut performance observation. 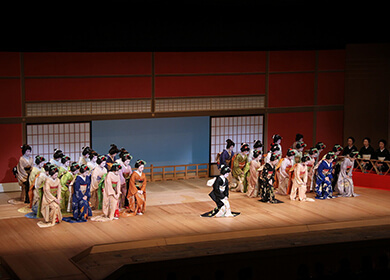 It is an annual event for learning the performing arts such as kabuki works, dance, and the shamisen. The elegant geisha and maiko sit in a gallery, and flowers are given to the popular performer’s performance. On this day, it has become custom for the maiko’s hairpin to be that of a new year’s willow decoration with two small maneki attached – they will pay a visit to the performer they have favor with during the show’s intermission, and have their names written on the maneki. Leading roles are written in black ink, while the female roles are written in red ink. The maiko who perform in December will have these pins in their hair. December 13th is called the “Susutori Festival” – on this day a great cleaning effort is held as preparations for the new year begin. This practice dates back to the Kamakura Period, but sometime in the early Edo Period the shogunate of the Imperial Court officially designated “Susuharai” as an annual event. In the Hanamachi, this date marks the start of one year, beginning with the new year’s preparations. The geisha and maiko make offerings of kagami mochi, a traditional Japanese rice cake with New Year’s decorations, to their masters and the tea houses to which they are apprenticed in order to show gratitude for the past year, and make greetings for the coming year.